Japan-based ink manufacturer Dainichiseika Color & Chemicals has invested in KBA-Flexotecnica’s Evo XD CI flexo press to advance the development of new inks for the printing of flexible packaging. KBA has developed Evo XD for use in testing of new water-based inks, specifically for printing on plastic films. The press will also help packaging printers to run trials of advanced materials without disrupting their own production. Next month, Dainichiseika intends to start operations of the new press at the production facility in Tokyo. 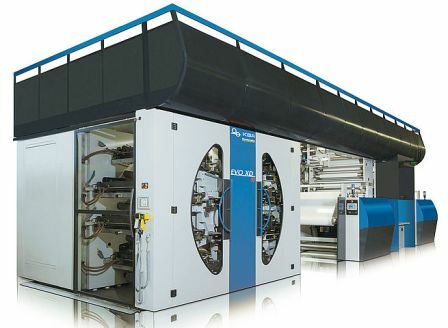 The eight-colour CI flexo press is a version engineered system for a web width of 1320mm and cut-off lengths between 370mm and 850mm. Evo XD press can be used with water-based inks for printing on a range of substrates such as films, very thin and sensitive breathable LDPE, laminated materials and paper. The press, which integrates energy-efficient dryer systems, provides maximum flexibility for different packaging applications. Evo XD features current X series modules, automatic impression system and integrated print error detection system. Established in 1931, Dainichiseika is engaged in the development, manufacturing and marketing of both functional printing inks and offset inks for flyers, books and packaging materials. The company also offers inorganic, organic and prepared pigments for printing, paints and other applications. Image: Dainichiseika has prepared Evo XD for the flexible use of water-based inks. Photo: courtesy of Koenig & Bauer AG.